Geraldine Hoff Doyle, a World War II factory worker whose bandana-wearing image in a wire-service photo is said to have been the model for the woman depicted in the 1942 "We Can Do It!" poster, has died. She was 86. 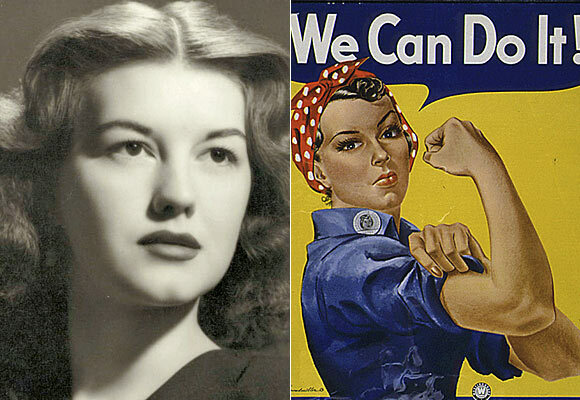 The iconic wartime poster became an enduring symbol of women's power from the Rosie the Riveter era. Rest in Peace, Ms. Doyle. How was everyone's Christmas? We all had a fabulous day, filled with family, friends and, of course..presents! 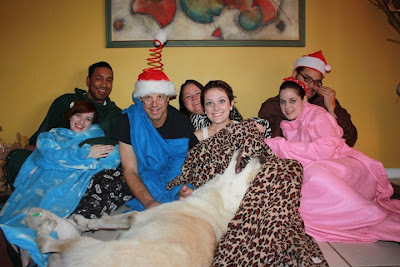 Santa brought my whole family Snuggies, now I'm just hoping the weather stays cool enough for us to use them! After breakfast the kids went off to visit their respective dads and Chip and I headed to the beach. Nothing says Christmas like Mojitos oceanside! Things have been so busy around here, I forgot to tell you that I lost almost 2 pounds again this past week! I'm less-than-one pound to halfway which means that JC starts weaning me off their food and onto my own. Yikes! I admit to being nervous about this but I'm sure I can handle it, especially since I have 100% support from Jenny through maintenance and beyond. I need the accountability, no doubt in my mind that's the main reason I'm succeeding this time! We picked up a huge set of this china for $10 at a local thrift store! Our little "Charlie Brown" tree..
Beren thinks Snowballs & beer are the perfect winter dessert! After dinner we lit the fire pit..
What I woke up to find this morning..
On the Mend..and in the 50's! Thank you so much for all of your healing thoughts and cyber-soup, they worked! By Wednesday afternoon I was feeling so much better, was able to participate fully in Kali's birthday celebration! 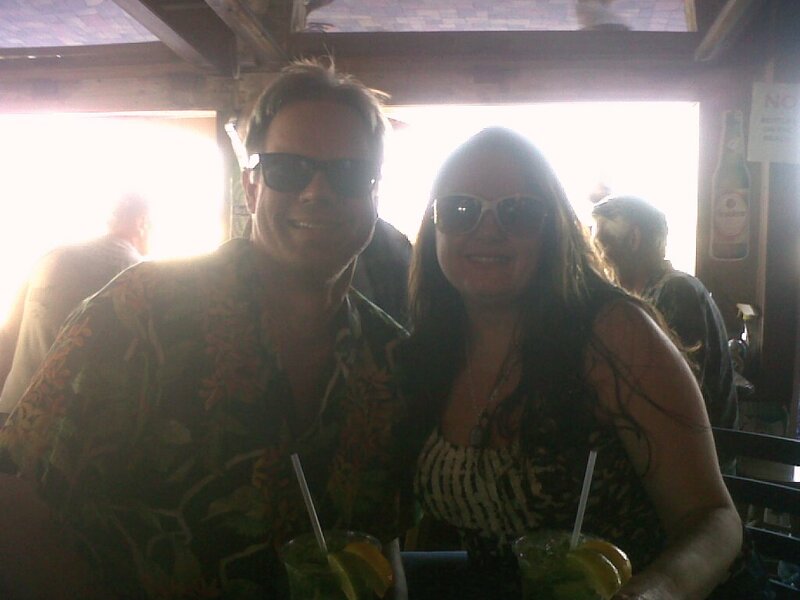 After spending the morning some quickie housekeeping, I met the Birthday Girl, her beau and my dad for lunch at a wonderful local Cuban restaurant, Las Vegas. Keeping in mind my fragile tummy, I ate a delicious bowl of chicken soup and a piece of plain Cuban bread. Mmmmm..just what the doctor (or nurse) ordered! I then parted with the family and went shopping for the celebratory feast. Kali requested deli food which in our family means only one thing: Gino's Italian Market. I'm a regular shopper there, try to stop by every week or so to take advantage of their great prices on fresh meat, cheese, and sometimes just to "window shop" in the bakery. This particular day I spent a good amount of time at the deli counter..Provolone and Salami and ham, oh, my! Along with Italian bean salad, macaroni salad & some fresh loaves of bread, a feast was in the making! The best part of the trip was the special attention I got from the elderly butcher who insisted that I sample everything I purchased and when I protested, accusing him of making me fat, he exclaimed, "I lov-a the way-a you look! Don't worry 'bout it!" God, how I love Italian men..
One last cruise by my favorite area of the store..but nope, no vino for me today..sigh.. Eschewing my Jenny Craig meal just this once, I joined my family in the consumption of our delicious feast..in moderation. Small sandwich, bite of bean salad, but when it came to dessert, I was not passing up the Cassata Cake! I had a small slice that, seriously, was worth the hour on the treadmill it cost me. Oh. My. Goodness. This stuff was fantastic! So, birthday celebration and tummy troubles behind me, I awoke Thursday morning ready to return to work..but first, my JC Consult. I am thrilled to report that I have broken through the 160's and weighed in at 157.6! Yippee!! Well, dear readers, I really should get off the computer and finish a few things around the house. Beren and I are headed up to our other home for the weekend, am hoping it's nice & chilly up there so that we can light the fire pit and do some serious cuddling. Have a Beauty-Full Day, TGIF! Wow, I have really had a streak of bad luck in regards to my health lately! Last week was the UTI, this week it's a stomach flu! It started on Sunday - chills, fever, vomiting, etc..started to let up a bit yesterday afternoon but am still not able to keep anything substantial in my stomach. YUCK!! I have a high pain tolerance and can handle most illness but am not good with tummy troubles, not good at all! The only upside to this whole thing is that I've lost 2 pounds, living on crackers and ginger ale with do that to you. Unfortunately I'm sure that weight will find it's way back to my body once I recover and resume normal eating. P.S. Lucifer is doing his best to provide comfort during my "time of need;" there's nothing quite like kitten purrs to heal body & soul, you know! My weigh-in on Thursday wasn't earth-shattering, only lost .50 pound, but as long as the scale continues to move in the right direction, I'll take it! I'm at 160 even now, can't wait to get into the 150's! Yesterday I took myself shopping, hoping to find a new pair of jeans and maybe a cute top or two. JCPenney had a big sale and while I was unsuccessful in the jeans department, I came away with some great deals on shirts (in a size smaller, thank you very much!) and also visited the lingerie department for some pretty new things. *wink* While I was there I got a bra fitting, as suspected I've gone down a size in that area as well. I'm not complaining, am happy to lose fat wherever it decides to leave me! In addition to new goodies for myself, I also finished my holiday shopping for everyone else, logging over 10,000 steps in the process! Now I can relax and turn my focus to wrapping, and baking, and cooking, and the multitude of little things that go into making a festive holiday. Hope all is well with you all and that you're staying strong with all of the sweet temptations out there at this time of year! You may feel particularly lazy and distracted today as you attempt to fulfill your usual obligations. At some point during the course of the day, you will likely recognize the futility of your efforts and put aside your agenda in order to focus on more relaxing pursuits. Your choice to unwind today may prove to be a boon to you where your responsibilities are concerned as it can afford you the time you need to recover your strength and enthusiasm. This can be a wonderful time to focus on activities that allow you to nurture and pamper yourself. Whether your idea of luxury is to settle in with a novel or hike through the woods, you can find ways to make the most of your laid-back mood. Rest can help us become more productive because it affords us an opportunity to regain our strength and clear our minds of thoughts that distract us from our purpose. As we unwind, our usual energy and enthusiasm return, readying us to face the next round of worldly challenges. Though we may seem to be doing little when we engage in activities that are purely relaxing, we are actually recharging ourselves. And breaks are an important part of the cycle of achievement because without them we would not be able to sustain our enthusiasm for the duties before us. Each time we refresh ourselves, we unconsciously reaffirm our commitment to our aspirations. When you indulge your lazy feelings today by relaxing, you will prepare yourself to prevail over the challenges yet to come. I stayed home sick yesterday, ended up at the doctor's office with a nasty UTI. Ouch! Sometimes being a girl is not fun! This is not the time of year for such things, either, the hustle & bustle of the holiday season does not allow for illness! As much as I wanted to scurry around and use the day for productive things, my body had other things in mind. So, I took my meds, filled a water bottle and laid on the couch, napping and reading for most of the day. By evening, I felt well enough to take Loki on a short walk and do 40 minutes on my treadmill, albeit at a slower pace than usual. I'm much better today, thank you antibiotics! I'm still going to take it easy and give myself time to recuperate, sometimes the best thing we can do is just sit down and listen to our bodies. I was on vacation the week of Thanksgiving, returned to work this past Monday. While I stayed mostly on program throughout the holiday and following days, I did get a bit lazy in my eating & exercising so I was concerned about my weigh-in. (I changed the day to Thursday because that works better for my schedule, by the way). Oh, and then there was the nasty time-of-the-month water bloat working against me, ugh!! I hopped on the scale with trepidation, only to find that the numbers weren't as bad as I expected: 160.8. So, I gained 2 ounces, big deal! Sure, I would rather have lost but I'm not going to complain. According to my bathroom scale, those 2 ounces are already gone so I'm sure to see happier numbers at my consult next week. The weather has finally cooled off here, it's a brisk 57 degrees here in the tropics. *grin* I know my northern friends want to kill me for writing that, don't ya? Loki and I are enjoying our nightly walks even more though he hasn't quite figured out the whole holiday decorations thing. Lights he can handle, moving figurines really freak him out. Lightly coat the skillet with non-stick vegetable spay and heat pan 30 seconds on high. Add the prepackaged Jenny Craig Chicken Fajitas, and let cook for 3-4 minutes. Incorporate the extra veggies into the skillet and stir for an additional few minutes, until thoroughly cooked. Sprinkle on fajita seasoning, and stir for 30 seconds. 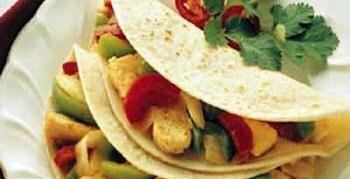 Serve immediately in tortillas and top with cilantro and pico de galo to make a Jenny Craig Volumetrics healthy and satisfying Chicken Fajita! Has anyone started holiday baking, and if not, do you plan to? I'm going to make cupcakes and a couple batches of cookies, am thinking (hoping) I'm strong enough to resist the goodies and that the joy of baking outweighs the misery of temptation! Hope all is well, have a beauty-full day!